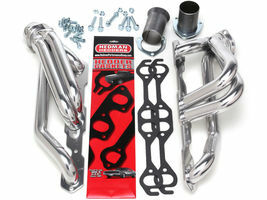 Hedman Hedders is the original, and still the premier manufacturer of performance exhaust headers in the world. Design and produced in their California manufacturing facility since 1954, no other header manufacturer offers as broad a selection of applications and design options in the industry. All Hedman street headers are backed by a lifetime warranty against manufacturing defects! Hedman's ceramic-metallic finishes are so tough, all HTC Silver, BLACK MAXX Black and Elite coatings come with a full 5 years warranty.